In our highly charged and highly competitive environment, it seems that our kids are spending more time outside the home than inside. In fact, we have been driven to give our children the best they can have in life that we sometimes forget why we did it in the first place. There is really nothing wrong with children learning new skills and gaining more knowledge but when they become too busy, they lose focus. So when do we know is the best time to ‘slow down’? First, you need to know the reason for sending your child to the class. Is it because all his friends are taking chess that your son needs to attend as well or is it because he really likes chess? Are you sending your daughter to ballet because you think it means she has some good extra curricular activities? Is it necessary to be this busy? In most situations, your kids have so many classes to go because the family is pressured not to be left out. It is mainly because other families are doing it so you feel compelled to do it as well. Do you feel that it is more productive for your child to learn something with the free time after school instead of watching television or playing with the computer? Is this the best you want for your kids? Many parents feel that they are doing the best for their children. That is why they send them for mandarin class, violin lessons, karate, football and art. So that they can master a bit of everything and while it is beneficial in a long run, it is the process of getting there that can be quite a challenge and constantly pushing and praising their children is the not the right way. The most obvious signs will show when your kids are too busy. If they look fatigue all the time and anxious, then something is seriously wrong. This could lead to bigger problems like depression and even withdrawal if you do not take notice. In some extreme cases, it could lead to physical problems like headaches and even stomachaches. And then, their grades might suffer too. The most important thing that you must remember is that it should be what your child wants, not you. 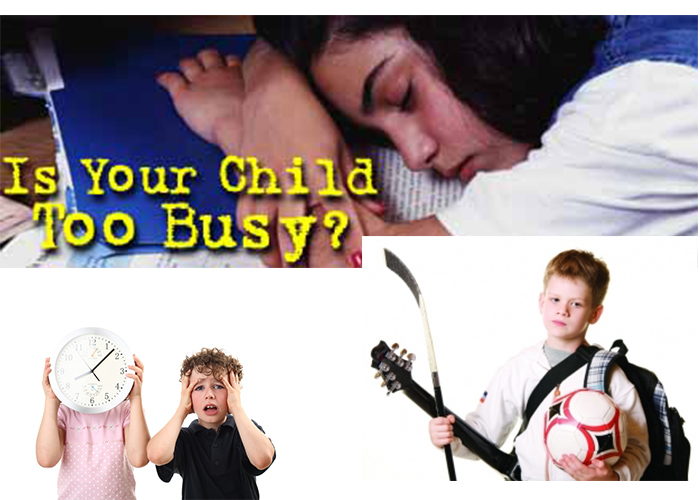 If you are very busy, there is no reason to make your kids busy too. Growing up is a natural and very fulfilling process, don’t let it pass you by without experiencing the best of it and most importantly, don’t let the teachers experience your child growing up while you are ‘too busy’ at work.